Everyone makes breads a different way, some out of necessity and some by preference. You can mix dough and shape it by hand before baking, or let a bread machine or stand mixer do the bulk of the kneading for you. And if you’re looking for convenience and homemade bread at the same time, a bread machine is often the gadget of choice. Whole Grain Breads by Machine or Hand gives directions that suit all mixing and baking preferences, so a wider range of bakers will find a use for it on their bookshelves. It gives complete directions for everything from making breads completely by hand as well as for making the same breads completely with a bread machine. The book is basically set up with different chapters for different types of breads. There is a “basics” chapter at the beginning, but the subsequent Multi-Grain and Sourdough chapters have their own mainstays. The recipes all include some whole grains, but aren’t completely reliant on them, so the breads will be just as appealing to whole grain newbies as they will be to those who have hand more experience with whole grain baking. The methods are given for hand mixing, stand mixing, food processor mixing, bread machine mixing and for mixing and baking the dough completely in a bread machine (the others assume baking the bread off in the oven). In addition to the actual breads, each chapter has recipes for serving those breads. For instance, Milk and Honey Wheat Bread could easily become Honey Orange Bread Pudding. It’s a good setup that means you’ll never be left wondering what to do with leftover bread – and once you start baking bread from scratch, the though of making do with leftovers when you could make a whole new loaf is just a little less appealing. The book is short on photographs, but the directions are clear enough that you shouldn’t have any problems turning out finished loaves. Again, the real asset here is that the recipes already take into consideration all kinds of special (and not so special equipment) so you can make whole grain breads at home with really no questions asked! I’ve been trying to find a book to help me get into bread making. This might just be it. Thanks! 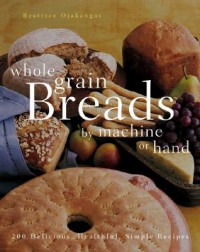 This is my absolute favorite bread making book! I especially love that you can vary the size of loaf you make – the sampler loaves are the perfect size for my husband and I.
I have been trying to get into making whole grain bread. This will be a great addition. My sisters bought this for me along with a lot of fun bread-making accoutrement (jams, honey, pans…). It was a great gift that really kick-started my bread baking, and the book is a great introduction. I agree with Erin; the different sized loaves are great! Just bought this book based on your review! It’s fantastic, and I have my first loaf baking right now. I love the variety of loaf sizes, and all the variations for preparation. Thanks for bringing it to my attention. I absolutely love this book! My husband gave it to me for our first anniversary, and I’m slowly working my way through the book trying new breads each time I bake. There are wonderful recipes, and they’re simple to follow. I’ve had fantastic results with these breads. This is amazing guide, especially those who are new to baking bread by hand (like me for example). Thanks for sharing this, I’ll definitely use your guide this weekend, as me and my husband are thinking of trying and making our own bread! My wife has really gone back to basics in recent months to carry on what her mother taught her when she was little. As well as taking up knitting again she’s also start baking cakes and bread again and in terms of flavour its just so much better than anything you could possibly buy from your local supermarket!!! We’ve been trying really hard to make spelt bread using sour dough, however every time we make it, it’s been too runny to make bread from and we’ve lost the sour dough. Is there an easy way of making new sour dough without borrowing a lump from someone else?